Gegard Mousasi is a Dutch Mixed Martial Arts Fighter who currently competes for American MMA promotion, Bellator MMA where he is defending Bellator Middleweight Champion. He made his professional MMA debut in 2003 and is also been the Dream Light Heavyweight champion, DREAM Middleweight Champion, Cage Warriors World Middleweight Champion, and Strikeforce Light Heavyweight Champion. 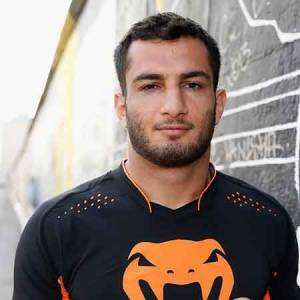 Gegard Mousasi was born on August 1, 1985, in Tehran, Iran. He is of Iranian nationality having an Asian ethnic background. His family shifted to the Netherlands where he received his high school education and developed his passion for martial arts. Mousasi trained in boxing and judo and was the amateur boxing champion of the Netherlands. His brother was also an MMA fighter like him and is an MMA trainer in the Netherlands. He began his professional MMA career in 2003 and went on to compete for several MMA promotions such as Pride FC Grand Prix, Dream Grand Prix, ADCC Championships, M1 Global, Dream Super Hulk Grand Prix, Affliction, Strikeforce, Dream, and the famous American MMA promotion, Ultimate Fighting Championship ( UFC). Mousasi later signed with another famous American MMA promotion, Bellator MMA in 2017 and later face off against Rafael Carvalho at Bellator 200 at London, England for the Bellator Middleweight World Championship. He won the bout and the title via KO in the first round of the match and his next fight is scheduled to take on Bellator Welterweight Champion, Rory McDonald on September 29, 2018, for his first title defense. As of 2018, he has a professional MMA record, 44 wins, 6 losses and 2 draws in 52 MMA professional MMA career so far in his career. The Iranian MMA athlete, Gegard Mousasi stands at a height of 6 feet 2 inches and 84 kg. He has a reach of 76 inches which he uses to his maximum effect in his matches against his opponents. Talking about his personal life, he is in a relationship with his girlfriend, Cindy Dandois and currently enjoying a happy and prosperous romantic relationship with no signs and rumors of the separation. Furthermore, there is no news about his other affairs, controversy, scandals, and other several mishaps as he seems to be a professional individual who is focused more on developing his MMA career rather than being tangled in rumors and controversy. He has earned a fair amount of money through his professional career as a successful MMA athlete According to the sportsdaily.com, his total career UFC earnings are estimated to be around $975,000. Even though his exact net worth has not been officially disclosed, it is estimated that his total sum is assumed to be close to $ 1 million.